Barry’s Let’s Rent It in West Bloomfield is SE Michigan’s leading rental company for paper and plastic supplies and party equipment. Our event equipment rentals range from coffee makers to popcorn machines to sound systems. Whatever you need to make your party a success, before you buy it new, call Barry’s Let’s Rent It to see if it’s available to rent. We have hundreds of items to help make your party or event a success. So unless you have storage space and a big budget, renting party supplies is better with Barry’s! If you are looking for an affordable party equipment rental company in metro Detroit, contact Barry’s Let’s Rent It. We’ve been a trusted tent rental company since 1982. Party and event planning is much easier if you have a great rental company to work with. If you have a party planner or event planner, we're happy to work with them as well. Barry’s Let’s Rent It offers a huge inventory of rentals from tents, place settings, and decorations to dance floors, meeting room equipment, and carnival food machines. If you’re planning a big party or event and need a great resource for party supplies and party equipment, call Barry’s Let’s Rent It. We have great prices and optional delivery and pick up. We deliver party supplies all over metro Detroit. If you need us to help set up your rental items, we can do that too. When you rent your event equipment from Barry’s Let’s Rent It in West Bloomfield, you get personal services and a delivery team with a great attitude. We’ve been renting party supplies and equipment since 1982 and have grown our business from referrals. So, if you’re looking for a dependable, local rental company in SE Michigan, you found it. Contact us now for great prices on party supply rentals in metro Detroit. You’ve decided on a beautiful outdoor wedding in Michigan. Now you need to plan for the ceremony, the reception… and the elements. Barry’s Let’s Rent It is SE Michigan’s number one supplier of wedding rentals. At Barry’s Let’s Rent It in West Bloomfield, you can rent decorative items like a wedding arch, Chupah, or wishing well, and practical items like a bridal cake knife and server. 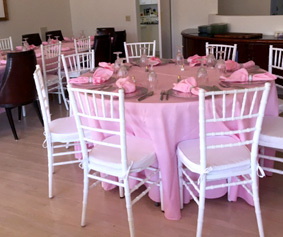 You can rent chairs for the ceremony and tables, chairs and linens for the reception. And no wedding is complete without a dance floor! When you rent your wedding tent from Barry’s Let’s Rent It, you can rent the staging and dance floor too. We have everything you need to make an amazing dance floor- from flooring and staging to lighting, projectors, and floor fans. We’ve been helping party planners get the most tent for their space at a great price for over 30 years. Make Barry’s Let’s Rent It your number one source for rentals in West Bloomfield. 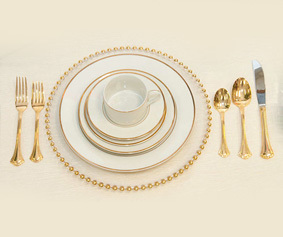 In addition to our basic tents and party equipment, you can a full table service including table cloths, napkins, skirting, chair covers, china, crystal stemware, glass dinnerware and flatware. You can rent steamers and chaffers, coffee and beverage service, and a portable bar. If you're looking for disposable tableware and paper decorations we have those too! Paper plates, napkins, disposable cups, streamers, centerpieces, and more! We have a full rainbow of colors and party themes to choose from. With Barry’s Let’s Rent It in West Bloomfield, we’re more than a table rental company, we help your party look complete! Call us now for a great price on rentals! Call: (248) 855-0480.